From the Plain, in the centre of Goudhurst, North Road leads to Horsmonden and Marden. Although there were several business properties in North Road in the late19th and early 20th centuries, it is now predominantly residential. On the 1851 census the road was known as Back Road but other records show it as Back Lane, not to be confused with the present Back Lane leading from The Plain to St Mary’s Church. On the 1861 census it is simply shown as ‘the road leading to the north gate’, which stood at the junction with Stoney Lane. By the time of the 1871 census it is shown as North Road and it now extends to the junction with Goudhurst Road leading to Horsmonden. The 1842 tithe apportionment map shows that most of the land either side of North Road was fields of various sizes. There were a few cottages but most of them were in the area near the centre of the village, where Rose Villa and Culpeper Mews are today, and towards the turnpike gate near Blind Lane, although the latter cottages would have fronted Stoney Lane. On the west side of the road the main landowners were Daniel West and the Devisees of Stephen Groombridge and all of their land was tenanted. The apportionments with cottages were occupied by: Thomas Wenham – a saddler and farmer, James Baker – a carpenter, George Freeland – a plumber and journeyman, and Samuel Beeching – a farmer. On the eastern side of the road the Devisees of Stephen Groombridge owned a large proportion of the land, but this was mainly a field. The few cottages situated between North Road and Stoney Lane were owned by: John Weller an agricultural labourer – occupied by himself, Edward Austen a bricklayer – occupied by himself, John Jones – occupied by William Pearce a labourer, and Jacob Luck, snr – occupied by Jacob Luck, jnr – a sawyer. There was also the turnpike cottage sited near to where Stoney Lane met North Road, which was occupied by the gatekeeper, William Haylor. Walking from the Plain towards Marden, the first property on the left is a house called Rose Villa. In 1841 this was the home of William Usherwood. William was a wheelwright and he ran his business in a workshop next to the house. However, in 1867 William died and his son, Alfred, took over the business. By 1881 Edwin, another of William’s sons, was running the business. Then, by 1901 Ernest Cobb, son of Joseph Cobb the wheelwright at Kilndown, took on the business at Rose Villa for a few years. In 1908 Stephen Crouch, who already held the workshop at Forge House on the Plain, also took the lease on Rose Villa. He used the workshop there for a few years but continued to live at Forge House where he died in 1931. Rose Villa itself was occupied by a succession of tenants. The workshop was used as a builders yard and premises by G & F Penn Ltd. from around 1930. Their advertisement in the parish magazine in August 1930 showed them as ‘Builders, Decorators, Sanitary Engineers and Undertakers’. 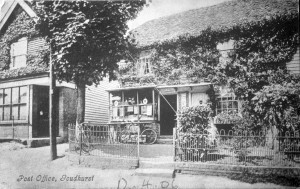 The company was primarily based in Pembury but had also been trading from Curtisden Green before coming to Goudhurst. In 1979 the company went into liquidation and was finally dissolved in 1985. The workshop at Rose Villa was later used as a garage run by Mr Kemp but was eventually demolished when the site was redeveloped in 2004. Continuing along North Road the next property is a shop called “Village Life”. In the 1850s there were three cottages on this site. Edwin Lindridge, who in 1851 had been living at Vine Cottage in North Road, purchased the cottages at some time during the 1850s from savings he had set aside from his earnings as a sawyer. Edwin started his grocers and drapers business from a room at the front of the first of the cottages and let the rest of the cottages until he needed more space for his business and to accommodate his growing family. Gradually all three cottages were incorporated into a house and shop. In 1852 Edwin had married Sarah Beeching, daughter of Samuel Beeching the baker in the High Street. On the 1861 census Edwin and Sarah are shown living in North Road with their children: Samuel aged 7, Catherine aged 5 and Frank aged 2. Edwin was a Methodist preacher and became Superintendent of the Sunday School at the Wesleyan Chapel in North Road. Miss Elizabeth (Betsy) Williams, a teacher and Methodist, lodged in a room above the shop. She held her Infant School classes in her room until an alternative room was made available to her at the Methodist Chapel in North Road. In 1888 Edwin and Sarah Lindridge retired to Tunbridge Wells and John Laing Humphries took over the premises. Their sons, Samuel and Frank, both went on to run grocery businesses of their own. Edwin died in 1905 and Sarah in 1914. In 1881 John Laing Humphries lived with his wife and young son, Lewis, in Brighton. He is shown on the census as a draper and tobacconist. 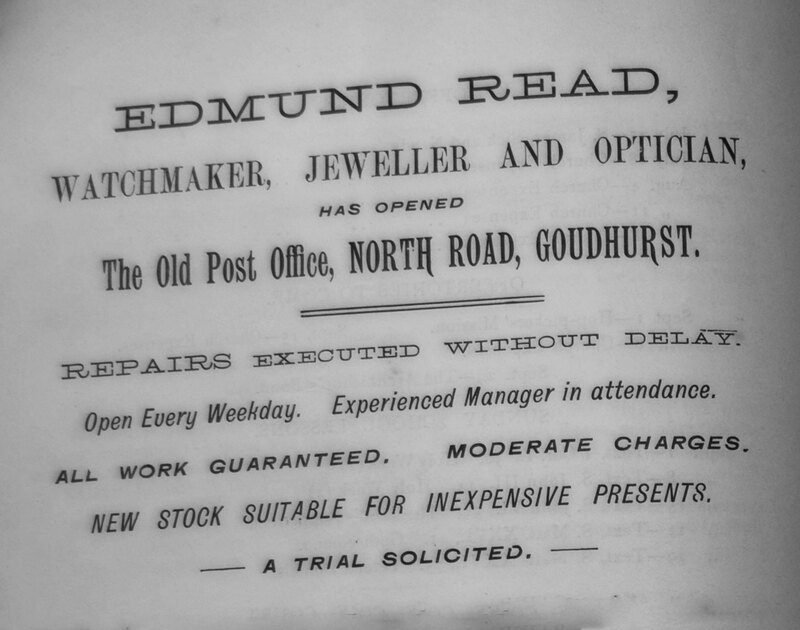 In 1888 John bought Mr Lindridge’s shop and moved to Goudhurst with his family. He now had a second son, Ernest. In the early 1900s Mr Humphries expanded the business by opening a furniture store in the lower of the three cottages. Mrs Humphries ran that shop while Mr Humphries carried on in his business as a grocer and draper and, in 1914, he took his son Ernest into partnership with him. John Laing Humphries died in 1920 and Ernest carried on running the business until 1928 when he too died aged only 42 years. Mrs Alice Humphries, Ernest’s widow, continued to run the grocery business for a while until, in 1945, Louis Weeks and Albert Brown, of Weeks Bakery in the High Street, took it over and the shop changed its name to Weeks and Brown. The furniture store was last advertised in the Parish Magazine in October 1936 suggesting that Alice closed that side of the business. The two cottages next to the shop are now one private house. More recently the grocers shop has become a clothing and gift shop. Going on down North Road there is a terrace of white-boarded cottages. In 1834 William Brown lived at the first cottage with his wife. He had a shop at the front of the cottage from which he sold gunpowder for the farmers to use in their guns. Unfortunately, Mr Brown and his wife were killed when some gunpowder exploded. The explosion is said to have been so violent that it blew out the side bay window of Goudhurst House in the High Street. The property was badly damaged but was subsequently repaired. In the 1840s Thomas Wenham, a saddler and harness maker, lived here. The 1851 census shows Thomas at the cottage with his wife Mary and their daughter Caroline, aged 23 years. He also farmed some land that he rented a little further down North Road. Thomas was still at the cottage in 1861 with Caroline but was now a widow. He was aged 64 years and was shown as a master saddler. Ten years later Thomas was still at the cottage but was now with his daughter Caroline and his son Edward. Edward was also listed as a saddler and harness maker. Finally, the 1881 census shows Thomas, aged 88, living in Church Road with Edward and Caroline. Thomas was shown as a ‘saddler and harness maker employing one man’ and Edward was still a harness maker. Thomas died in 1882 aged 90 years. By the 1871 census Matilda Stevens, her sister Emily and her mother Harriett had all moved from West House, where her brother George was postmaster, to North Road and started a small business here. Then, when George died in 1878, Matilda became the village postmistress. The 1881 census shows that Miss Matilda Stevens had taken over the lease of the property and was running the village post office and a stationery business from here. Harriett died in 1882 aged 94 years and Emily died in 1895 aged 83 years. Matilda carried on as postmistress until 1904 when Rose Midmer, who had been working as her assistant, took over the premises. 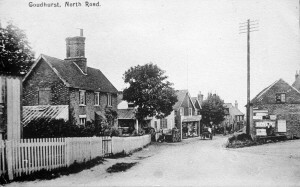 Rose subsequently purchased Goudhurst House in the High Street in 1911. 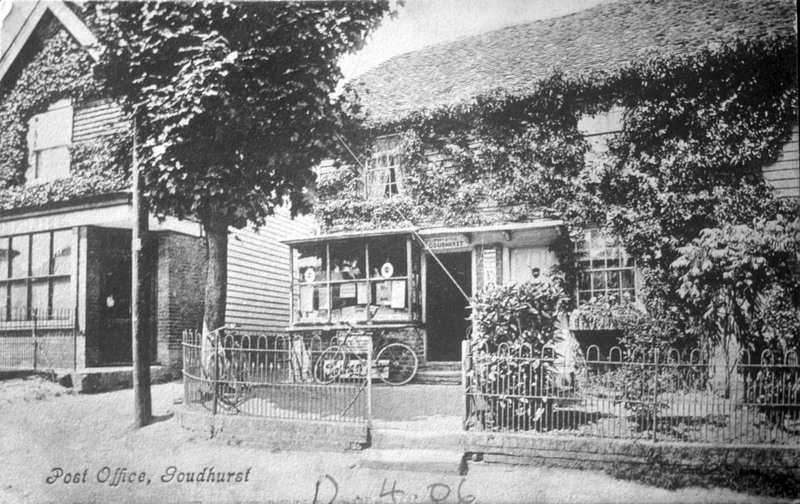 After considerable renovation work on Goudhurst House, including reinstating the bay window destroyed in the gunpowder explosion in the North Road shop in 1834, she moved the post office and stationery business there. 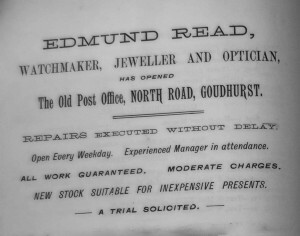 An advertisement in the parish magazine of September 1912 shows Edmund Read, a watchmaker, jeweller and optician. 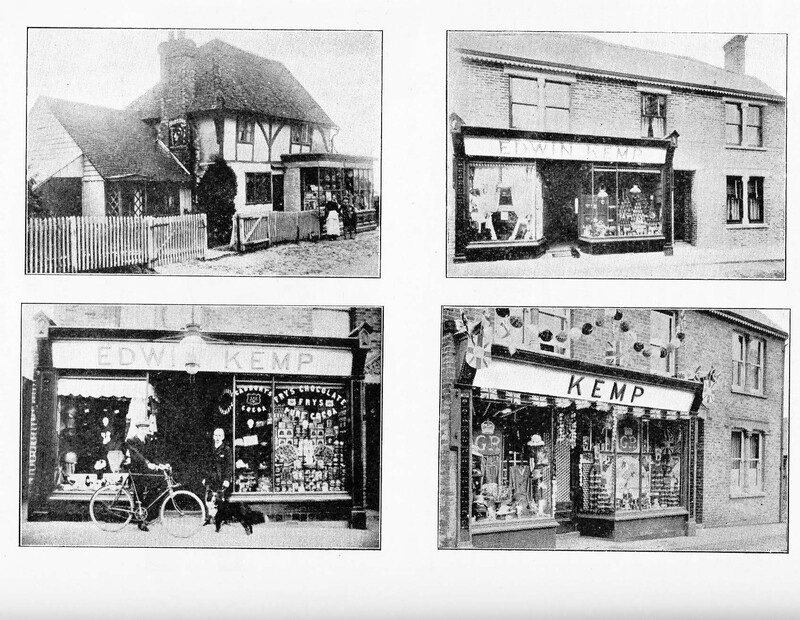 His shop is also listed in the 1913 Kelly’s directory along with his existing business in Stone Street, Cranbrook. Edmund died in 1913 and his wife, Ada, carried on running the shop for a while. The last entry for ‘E Read Jeweller (Mrs)’ is in the 1918 directory but Ada carried on advertising in the parish magazine until June 1919. In July 1919 an advertisement appeared in the parish magazine in the same design as that used by Read but the business name had changed to ‘May and Kent (late Ada Read)’. The advertisement only appeared for a couple of years. Mr Frederick Martin then took over the North Road property and continued to run the clock and watchmaking business. Fred and his wife and family lived there for a number of years but Fred died in 1940. The 1938, 1939 and 1940 directories show that Fred’s son Archie was running a greengrocer’s shop in North Road. Today the property has reverted to a private residence. At the far end of the row of cottages Mr Arthur T Richards ran a confectionery business in the early 1900s. His name appears in the commercial directories between 1913 and 1937. This shop is also now a private house. Beyond Cliffe Cottages is a pair of semi-detached Victorian cottages. 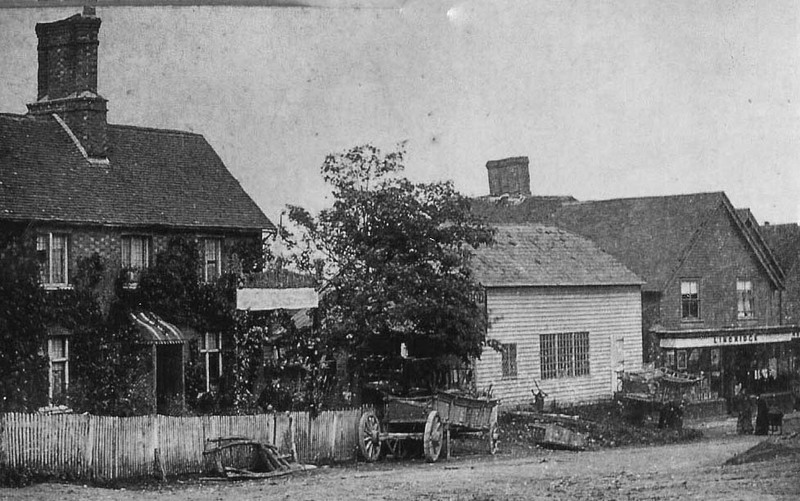 The 1861 census shows John Taylor, a grocer, and his wife Elizabeth living at the property. The property had originally been a pair of old cottages but John was occupying them both as a house and shop. Elizabeth died in 1889 and it appears that John gave up the property then and Edwin Kemp took it over. Edwin Kemp had come to Goudhurst from Whitstable in 1890, the same year he had married Fanny Lucy Epps. He ran the shop in the existing premises for 12 years adding a small extension to one side for his sister Annie to live in. Annie was a dressmaker. Then, in 1902, Edwin demolished the old buildings, a bit at a time so he could keep the business running, and built a new house and shop. Annie moved into the new house with Edwin and his family and the extension he had built for her to live in became storage premises for his shop. Edwin died in 1923 leaving the business to his wife and his two sons, Stuart and Frank. In 1925 the three-way partnership was dissolved and Stuart took over the business with the help of his wife Dora. Stuart had learned his trade working as a grocer’s assistant in Staplehurst. After running the business for some years circumstances compelled Stuart to sell the business to Ronald Firrell. Stuart went to work in Tunbridge Wells for a while, and then he returned to Goudhurst and worked for Weeks and Brown. Mr Firrell’s name appears in commercial directories as a shopkeeper and fruiterer in Goudhurst between 1938 and 1948. Today the shop and house has been divided into two residential properties that have both been extended at the rear. A little further down North Road, and on the opposite side of the road, is the Wesleyan Chapel. In the early 1800s the members of the Goudhurst Methodist Church held their meetings in a small room at Samuel Beeching’s bakery (now Weeks Bakery and Tearoom) in the High Street. However, as the congregation grew the room was too small and so fund-raising began to build a new chapel. In 1836 the sum of £50 was paid for a piece of land between North Road and Stoney Lane and building began shortly after. By 1837 the chapel was in use. In 1878 sufficient money had been raised to build a new chapel building in front of the existing building. The new building was the Methodist Church and the old chapel building was used as a schoolroom with classes run by Miss Betsy Williams. When education became free and compulsory pupil numbers declined in favour of the National School and the Methodist school closed in 1893. Sunday school classes continued for the children and then, in the war years from 1939 to 1941, the schoolroom was used for weekday lessons for evacuated children. In 1955 Beech House, which stands behind the chapel and adjoined the schoolroom, was gifted to the church Trustees for use as a Chapel Cleaner’s house. It was subsequently sold in 1971 and the income invested to provide funds to cover caretaking costs. Over time congregation numbers declined until in 2000 there were just 10 members. The church closed in 2002 and in 2010 the building was sold. Although it is still recognizable as a former chapel, it is now a residential property. Almost at the junction of North Road with Stoney Lane is a pair of Victorian cottages. Mr H Baldwin is listed in the 1911 census as having a shop here. Kelly’s directory of 1913 shows him as a tobacconist but the reminiscences of a late villager recall that the shop was a gents’ barber that also sold cigarettes and sweets. In 1935 Mr G Sargent is listed in the street directory as living here and carrying on a business as a fruiterer and greengrocer. In the 1940s William Fishenden was running a radio and electrical workshop from here until he died in 1973. Both cottages are now private residences but one is still named “The Old Shop”. There is mention in our archives of other businesses in North Road but, as yet, we have found little information about them. In January 1932 Hatch Bros. were advertising their business in North Road as ‘Builders, Decorators, Sanitary Engineers and Undertakers’ before moving their business to premises in Back Lane in 1934. In January 1924 Fred Southon advertised in the parish magazine as a ‘family butcher’ at North Road. We know he ran his business from a lock-up at the bottom of Hunts Lane where it joins North Road. However, we know far more about his business once he moved to his new shop at Alexandra House in the High Street in 1925. 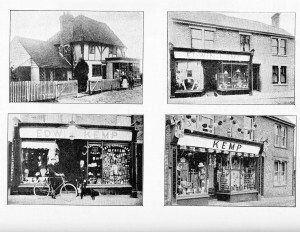 There was a number of shops and businesses in Stoney Lane at various times but we have only names and trades. Most of the properties no longer exist. In Kelly’s directory of 1930, 1934 and 1935 James Vaughan was listed as running a boot and shoe repair business from his home, 8 Stoney Lane, while his wife was a fruiterer. At one time Stoney Lane was the main road from the Marden direction into Goudhurst, but today it is a public footpath and is considerably narrower than a road. North Road is now the main highway but only one shop remains.